A stylish roof is the ultimate accent for a beautiful home and it’s one of the first things people notice about your house (if they don’t, they should). The right “hat” on your house can be the thing that turns it into a Parade of Homes showcase. In some of the most historic and prestigious neighborhoods in Miami, you will see mission-style homes that are set apart with their traditional red barrel roof tiles. You aren’t limited to the classic style, either. Historically, tiles were made from local clay, much like bricks, so their color tended to be regional and subject to the colors of the clay available. Now, clay comes in many options, styles, textures, and colors, allowing you to create a very unique look specialized for your home. Recently we have finished some beautiful modern tile roofs in white and charcoal, and some interesting blends with brown and reds that give off a more traditional vibe. With modern innovations, manufacturers can produce tiles that complement any architectural style, whether it’s Mediterranean, New England Colonial, Contemporary, and yes, even authentic Mission styles. With different shapes, materials, and colors available, your roof can be the spitting image of a centuries-old terracotta treasure or you can be a roofing avant-garde with colorful French interlocking tiles that create a dramatic shadow effect. Tile roofing has a long history, about 12,000 years, in fact. Many important buildings in the ancient Chinese and classic Greek cultures used clay tiles due to their strength, longevity, and their resistance to fire. In the days before fire hydrants, a fire could easily jump from roof to roof. In many places over the last 2,000 years, fire-proof materials were required by law, and there was no better candidate than terracotta tile. As an architectural style, tile is making a bit of a comeback due to the ability for more creative designs and ornamentation. One thing that sets them apart from their modern counterparts is tile is a 100% natural green product. They are made from the earth, are chemically inert, and completely recyclable. Whether you are seeking ornate design or a simple and sleek look, there is a tile to suit your style. Ludowici, for example, has been producing a wide variety of tiles for well over 100 years. Want something different and unique? Manufacturers can create custom tiles, or match tiles from historic buildings, or even manufacturers that are no longer around. Perhaps you’re after something a little closer to Mother Earth? If you want the look and feel of traditional hand-made tiles in earthy colors, Redland Clay Tile is a personal favorite. Each tile is a work of art that captures the elegance of classical styles, such as Spanish or Roman. As Miami’s premier roofer, I’ve seen the result of low-quality products installed by inexperienced, fly-by-night roofing bandits. While this is true for any roof structure, it seems especially disappointing with tile, because the customer expects a high-quality, unique roof. 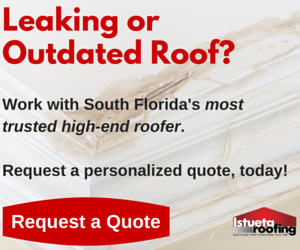 When done right, your first roof should be your last. That is even true in Southern Florida where we see occasional severe weather. Tile can easily stand up to the abuse that would cause a normal roof to fail, but it does need to be installed properly, such as having adequate support for the weight of the tile and a slope on the roof. If you are looking for a new roof that pops, is energy efficient, and will last for decades, then you’ll want to consider what tile has to offer. Whether 2,000 years ago or today, tile roofs have been the signature piece of premier homes around the world. So if you’re ready to add a touch of old-world sophistication to your Miami home, give us a call today and see what Istueta Roofing can do for you.